Rose to fame with the rest of the K-pop girl group I.O.I when it was formed on the reality show Produce 101. The group celebrated several years of success and released two EPs before they dissolved in 2017. She then went on to join the group Pristin. She studied at Shanghai Conservatory of Music and joined the Pledis Entertainment family at only eleven years old. She has appeared in music videos for a number of other groups including Orange Caramel's "My Copycat" and Seventeen's "Mansae." 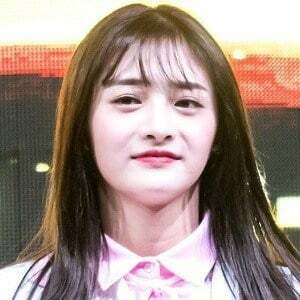 A Chinese native, she has been known by the stage name Kyulkyung. Growing up in Shanghai, she trained extensively in South Korea before gaining fame on Produce 101. She is joined in Pristin by fellow former I.O.I member Lim Na-young.